There has been a lot of severe weather around the region in the last couple of days and the biggest headline has been the Joplin, Missouri tornado. As of the time I am writing this, 117 people have been killed. My thoughts go out to the people of Joplin. Somehow the national media (CNN, Associated Press, etc) have been calling this the deadliest tornado in U.S. history. That is incorrect. The deadliest tornado in U.S. history was the 1925 Tri-State tornado which killed 695 people. It killed 234 people in Murphysboro, Illinois. The tornado was on the ground for 219 miles and produced 3.5 hours of continuous destruction. The National Weather Service in Paducah, Kentucky has a nice web page with additional information on the Tri-State Tornado. The correct information regarding the Joplin tornado is it is currently tied for #8 all time in deadliest tornadoes in U.S. history. It is also the deadliest tornado since 1947. 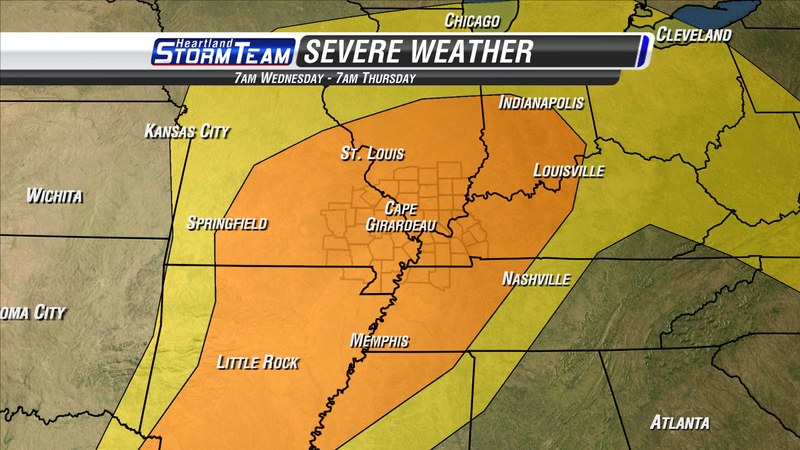 Now, regarding the Wednesday severe weather threat. The Storm Prediction Center has a large swath of the midwest in a "Moderate Risk" of severe weather from 7am Wednesday through 7am Thursday. The Moderate Risk area includes all of the KFVS viewing area (southeast Missouri, southern Illinois, western Kentucky, northwest Tennessee and northeast Arkansas). 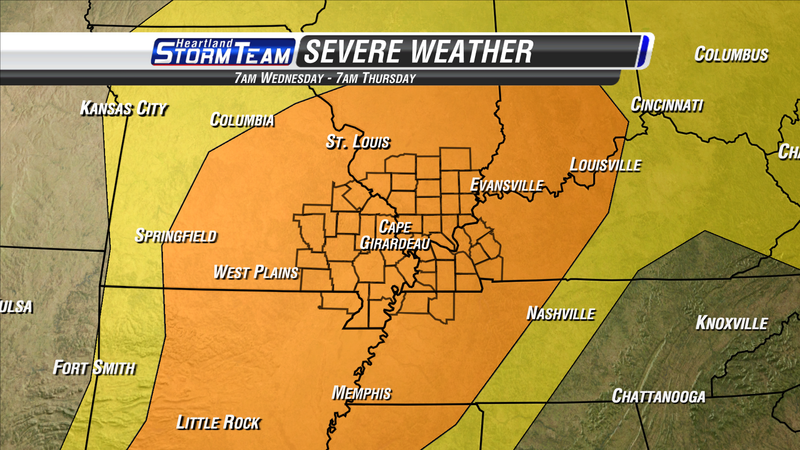 Here is a wider view of the outlook for 7am Wednesday - 7am Thursday. The "Moderate Risk" area includes places like Indianapolis, Columbus (IN), Bloomington (IN), Evansville. 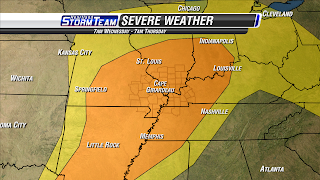 All modes of severe weather will be possible tomorrow. The main threat appears to be tornadoes, damaging wind and large hail. In particular, some of the tornadoes could be strong and long-tracked meaning they have the potential to stay on the ground for a while. 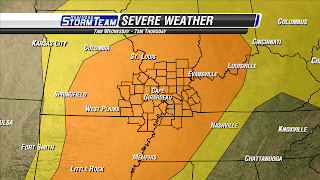 The main time frame I am most concerned about is from 1pm CT through 8pm CT in the KFVS viewing area. Times will be a little later for central Indiana (maybe 4pm ET to 11pm ET). Also, there will likely be some morning storms. These will be the "leftovers" from storms that develop in Oklahoma, Kansas and western Missouri this afternoon/evening. I know everyone's senses are heightened after we went through in April and the Joplin tornado. What I said above is not meant to scare anyone. It is meant to present information, as I see it, so you can stay informed. It is important to know what could be coming. I've said it before and I'll say it again, if you do not have a NOAA weather radio PLEASE pick one up. They really can be lifesavers. I strongly believe that every home, business and school should have one. They are just as important as smoke detectors. Yes, I am aware that Wednesday is the 25th. I usually put the date of when I am making the post in the title. That way it is easier to go back and find blog entries for specific days after a couple months has past. Thanks for providing us with up to date information. Your time is much appreciated. Thanks John for spending your free time keeping us informed, what an invaluable service! John, you always do a great job. Thanks for giving us direct information.